ही फयल Wikimedia Commons हांगाची आनी ती हे प्रकल्पां खातीर वापरल्यार चलता. 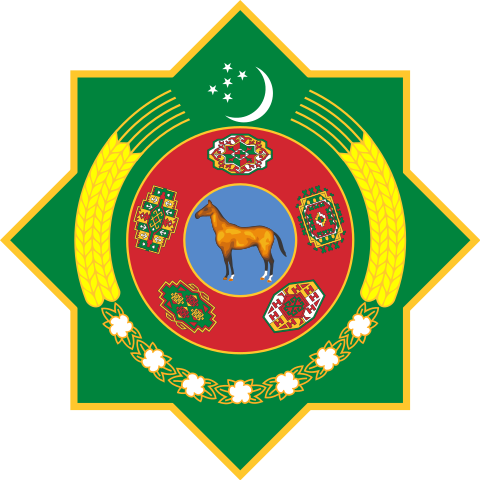 (तिच्या https://commons.wikimedia.org/wiki/File:Emblem_of_Turkmenistan.svg ह्या फयलींतलें वर्णनाचे पान) तातूंतलें वर्णन सकयल दिलां. English: The Emblem of Turkmenistan with realistic image of the horse (Yanardag with white spots on its legs). This version is used in present on 2012 http://tax.gov.tm/. Colors are in accordance with the Regulations about the State Emblem of Turkmenistan on August 25, 2003, clause 3 (Russian text - http://base.spinform.ru/show_doc.fwx?rgn=25217). आताचें 15:50, 3 फेब्रुवारी 2019 531 × 531 (176 KB) Zscout370 Reverted to version as of 21:21, 28 January 2019 (UTC) the colors were changed in 2017 and the 2000-2003 emblem had different specifications for colros and shapes.And you've asked me to match the curren flag colors with this..